Ask the administrators whether the „Warmup SSRS Reports“ batch job is scheduled to run every morning (before the first user typically logs in). You can also check yourself for that batch job, if you have access to System Administration > Inquiries > Batch Jobs > Batch Jobs. Look for an entry similar to the following – it will probably be scheduled to run once a day, early in the morning. What does this do? 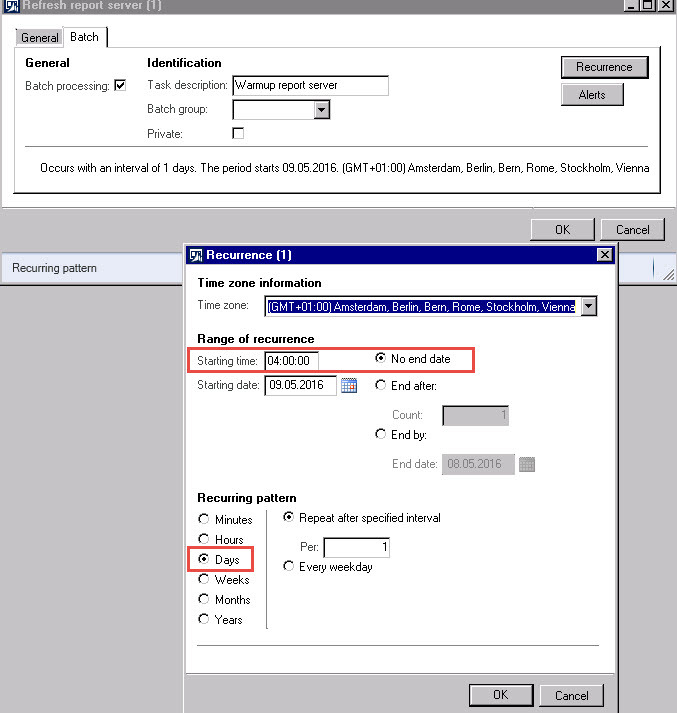 This batch job will, so to say, wake up the SSRS server so that this is not done by the first user printing the first report in the morning. In the AOT, go to MenuItems > Output > SRSReportServerWarmup and open that entry. set the check box for batch processing. set the recurrance to daily, in the morning. Additionally, you might discuss with your developers whether it makes sense to include some reports explicitly in the warmup process. What does this do? The batch job will then not only „warmup“ the server but those reports will have been „prepared“ for execution, too. This is not a cure for badly constructed reports! The warmup feature is included in CU7. If the application is not there yet, let your developers try to import it from CU7.